Avary and her mother, Ruth, have worked hard all morning making a surprize, giant cupcake for their friend and neighbor Miss Hester. Everyday after school Avary stops in to visit with Hester who fell and broke her hip while pruning her climbing rose bushes that grow up the side of her stone cottage. Avary has been doing chores and helping in the garden until her friend heals and asked her mother to help her with a surprize for their ailing neighbor. Getting up at the crack of dawn the mother and daughter team made the most delicious giant cupcake and frosted it with fluffy pink butter cream frosting. Ruth sent her daughter up Clover Hill to the little cottage at the top of the lane with her sweet treat in hand. Soon I will share with you another project that I'm doing for our bedroom. It's been fun and I can't wait to show you. 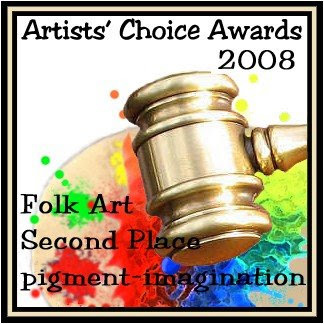 I was honored to find out that I had won second place in the Artist's Choice Awards on eBay for the "Folk" category. Now, I've got to get back to the mess, hmmmmmmmmmm, I mean project I'm working on. Great painting. Congrats on your award. Keep those brushes wet. Love this painting! Congrats on your award! That is wonderful!!! it never cease to amaze me the amount of details you put into your art... the stone walls, the creeping roses, the shadows cast by the fences, the impeccable shading of the hills (that's the most difficult to do when i tried doing landscapes in folk art) ... no one deserves the award more than you catherine. you are a true master! Perfect painting, as usual! Congrats on the award! Just another darling painting!! Congrats on 2nd place, what an honor!! Congrats on your win!! 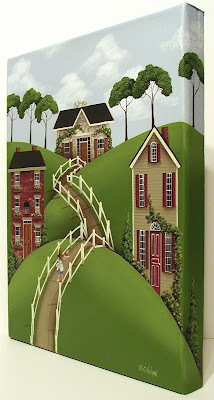 I love "Clover Hill"...it is gorgeous! 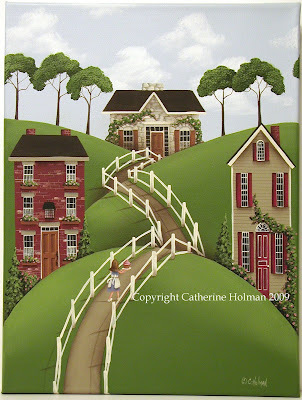 Love Clover Hill Catherine...especially the beautiful rolling hills w/fence...so lovely. Congratulations! You certainly deserve the honor, Catherine. I love the painting you are featuring here, so beautiful. Congratulations on your award Catherine! Good Job!! Cathie - you should have won 1st place in my opinion!! Congratulations on your award! You know how much I love your work!! Hey Cathie congrats on your award! This painting is so darling! The green is so vivid in this painting that I can just about smell the grass! Can't wait to see your new project. Pop by my blog to enter in my new give away! Wow, that is a great painting and would make a wonderful screensaver. Have you thought of doing that? That is really beautiful and I would love to be the one walking there, except it looks rather "hilly" and my arthritis would act up. Great job. By the way, I'm visiting your blog via Pennys. Thx for sharing.